Let me preface by stating that I am the only McLean & Eakin staff member who read (and enjoyed) 50 Shades of Grey. So, naturally, when Fifty Shades of Chicken came into the store I was curious. Okay, curious is an understatement. I spent at least 10 minutes in awe over this cookbook. At first, it was because behind every picture of a dish there was a well-toned man. However, once I read some of the recipes awe quickly changed to intrigued. I had to purchase this cookbook and test some of the recipes out. The book offers new and the occasional spin on old recipes as well as options to prepare and cook a chicken that I never knew were possible. My favorite dish was the "White Wine-Steamed Chicken Breasts With Sesame Oil and Scallions". I will admit, I was a little apprehensive about steaming my chicken in white wine, but trust me, it is AMAZING. This dish is incredibly flavorful, healthy, and easy to make. 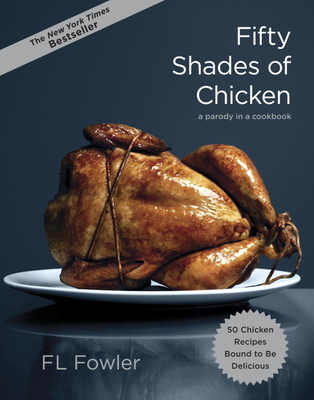 While titles of some of the dishes, such as "Dripping Thighs", will turn you fifty shades of red, the recipes will turn you fifty shades of satisfied. FL FOWLER is a pseudonym.